For the last 35 days, business and government in Washington D.C. was being held back by a fight between the President and Congress. Finally, the logjam was broken. It’s a pity it was too late for for one of the city’s premiere eating events. The furlough happened at the same time as the Metropolitan Restaurant Week where in numerous restaurants offer a limited menu of an appetizer, entrée and dessert in the hope of luring patrons who have never visited to do so. So this post is about lunch. Normally I don’t stir myself to go out to D.C. restaurants. They are expensive. I decided that, with the shut down, that they needed my patronage and that I might be able to find seating for once. This year Restaurant Week was filled with empty seats so the municipal powers-that-be extended it for an additional week. The lunches were $22, dinner $30, and additions like a cup of tea $4 or a glass of wine, raise that bill. Hence I didn’t get out for under $30 with tax and tip at any restaurant. Sushi Ko had mostly older couples, or well-tailored business people from nearby Microsoft. I chose the seaweed salad, tempura, and sushi. All were excellent and I left well filled by my choice. Old Ebbitt Grill near the White House is popular for its storied history. They say you can’t go there without seeing a D.C. celebrity. Sitting at the bar, I saw many deal-making young businessmen in for drinks, or waiting for their tables with a buzzer in one hand and a drink in the other. 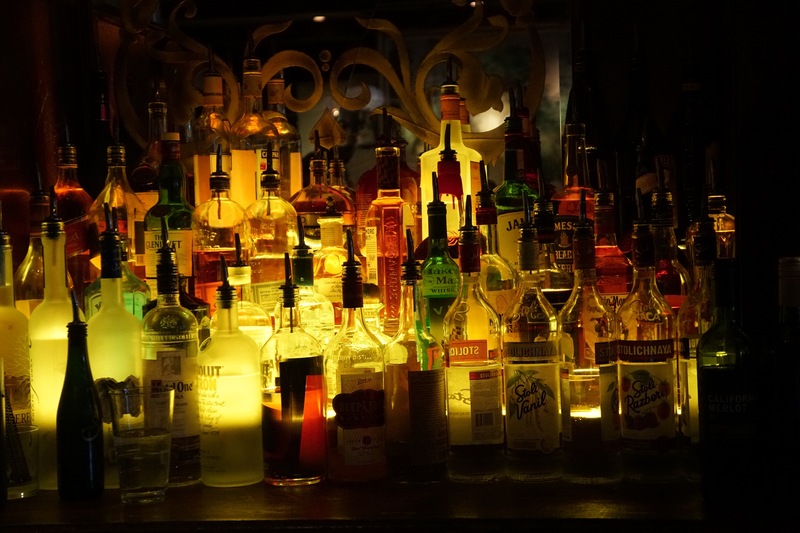 The bartender said the customer traffic had dropped by 44% because of the furlough. The first course was oyster gumbo which was a bit too thick for me, then beef bourguignon which tasted great, but in the low light actually looked like a bowl of dark port wine with lumps of beef. Dessert was crème brûlée. I had been walking through the National Mall with all its closed museums, so this filling meal was enough for the rest of my day. It was raining cold and hard, and a blowing wind nearly took away my umbrella as I walked to Ristorante i Ricchi near Dupont Circle made up for it all. Quiet, half-empty except for several family groups, I had a wonderful waiter who was solicitous without being overwhelming. 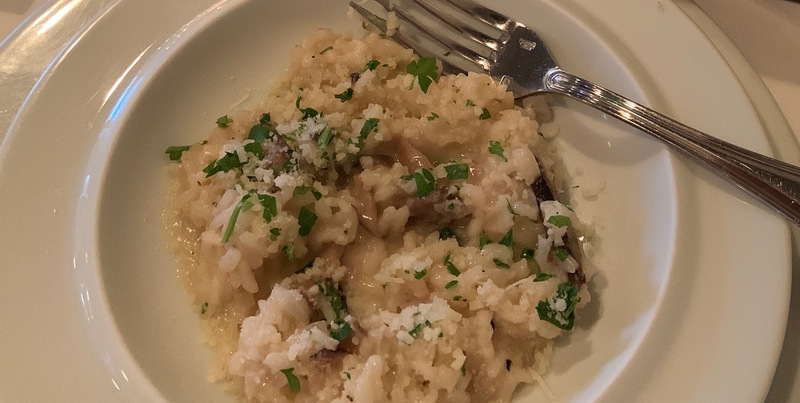 The warm mushroom riosotto appetizer was the first tip that this restaurant was going to live up to its excellent recommendations. Then came ‘Papparddelle Alla Bosciaola’ which had handmade noodles with tomatoes, sausage, mushrooms, and olives. The only fault with this dish is me. I don’t like tomato-based dishes much, but I wanted to try the noodles. 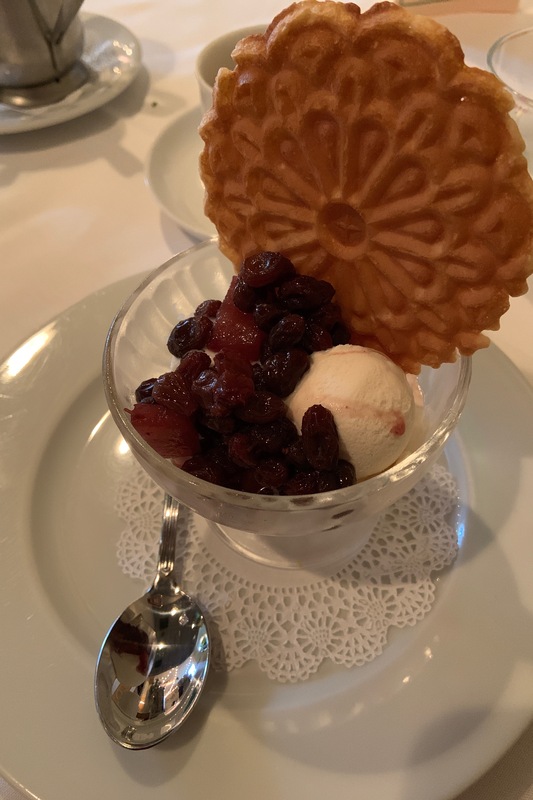 The dessert was hand-made vanilla gelato with “warm spiced fruit” and a cookie. Oh, wow. Unbelievably good. My final lunch was Bistro Bis up on Capitol Hill. Empty when I walked in, it filled with mostly people holding meetings. This was Business/Congress DC on display, all trying to portray themselves as important, whether or not they actually were. Deals were being negotiated over duck, chicken or salmon. 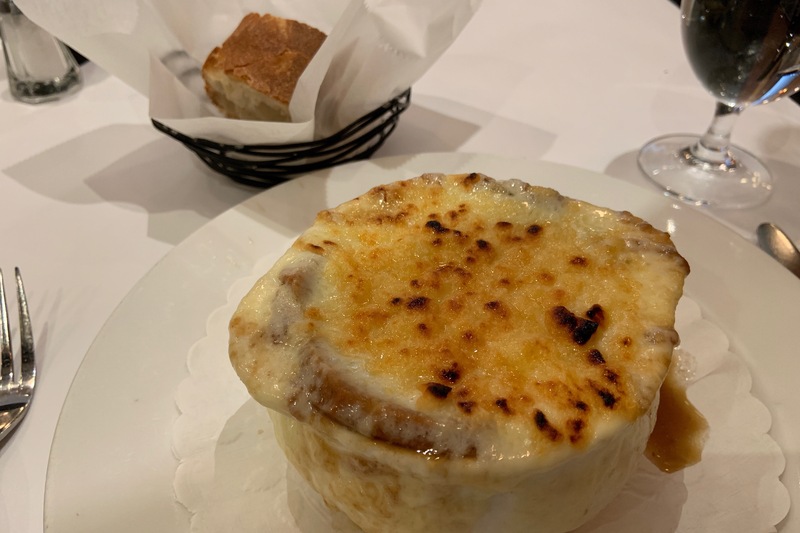 I started with ‘Onion Soup Les Halles.’ The only flaw in this was that the soup under the well-melted cheese topping was filled to the brim and spilled as soon as I put a spoon in. Nonetheless, I enjoyed the gooey delight. The next course was ‘Trout l’Ardenaise’ with bacon, capers, and a little over-salty. The dessert was ‘Tarte aux Pommes’ or apple slices wrapped in dough. So my great conclusion? Restaurant Week is a great thing to test new restaurants if you can afford it. I spoiled myself this January. The clear winner ? Ristorante i Ricchi in Dupont Circle. All three courses were divine. Definitely for special occasions. I can’t wait for the next Metropolitan Restaurant Week. I’ll start saving my pennies now. This entry was posted in 2019, Food, Washington DC and tagged Food, Washington D.C.. Bookmark the permalink.